“Excuse me sir, do you mind if we turn this down this down,” Morgan Elise Johnson (COMM11) asks an older gentleman as he takes a puff of his cigar. He hands her the remote and she hits mute to the basketball game before Tiffany Walden (BSJ11, MSJ12) launches into her spiel. They’re in a smoke-filled room at Keyman’s Club, a members-only venue in Chicago’s South Loop. The team works out of the multi-use space and gallery, but tonight there’s a 45th birthday party complete with food, drinks and dancing, and 50 Cent’s “In Da Club” is playing in the next room. Walden is co-founder and editor-in-chief of The TRiiBE, a website that was launched in February 2017. “It focuses on changing the narrative of, or reshaping the narrative of Black people and Black millennials in Chicago,” Walden said. “When I came back home there was this need to really tell a different story about the Chicago that I know and that I grew up with,” said Walden, who grew up on the West Side. 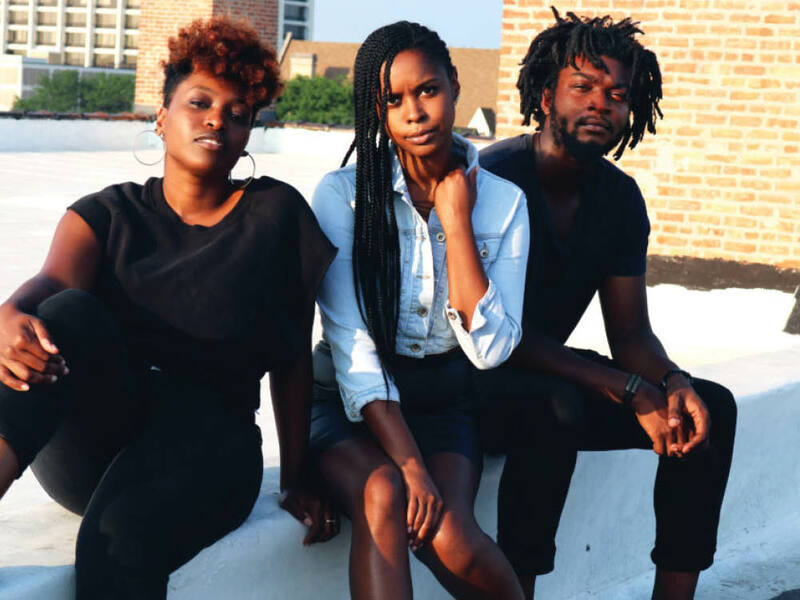 They decided to build a company that would help show a different side of Chicago and connect Black millennials in the city. In October of 2016, they bought the domain anticipating a launch late the following year. However, national conversation around violence in Chicago intensified as President Donald Trump continued to turn an eye to the city. On January 25 he even tweeted that he would “send in the feds” in response to the “carnage.” Suddenly, The TRiiBE’s mission was even more pressing. “It felt really urgent because of the state of the country and it felt like people needed to know that this is not Chicago,” said Johnson. They connected with fellow Northwestern alum and Chicago native David Elutilo (Weinberg13), a web developer and designer. At a party, he’d casually told Johnson to connect with him if she ever needed a site and she called him days later. He saw it as more than an opportunity to build his portfolio. “I saw this as a way to connect with the city that I always lived in and to contribute to it as well,” said Elutilo. Since the launch, the team has been navigating the world as entrepreneurs in the ever-changing field of media. During the summer of 2017, MTV and Mic pivoted to video, thus laying off writing staff. Freelancers for Ebony Magazine sued the new owners for payment in September. And in November Joe Ricketts shut down DNAinfo and Gothamist a week after New York offices unionized. “You’re sitting around watching all of this stuff around you and it’s like why do we even do this when so many people are drowning,” Walden said in a slightly exasperated tone. “But it’s also like ‘what can we learn’,” noted Johnson. to connect with their audiences. When it comes to the future of The TRiiBE, there’s excitement all around. Before the interview wraps up, a man opens the door to the cigar room. He pauses a moment as if he’s going to apologize for interrupting, but instead yells, “Party party party. Turn up on a Sunday!” In unison the TRiiBE team lets out an “ayyyyyy” and then bursts into laughter. “Black space, Black art,” Johnson chimed in. “This is a beautiful party. All of this artwork in here is made by Black people and it’s beautiful,” Walden continues. They mention that just upstairs, there is a music studio where the owners let them work for free during the summer months. They eventually moved to the Keyman’s Club, which donated office space to The TRiiBE because they support the vision.